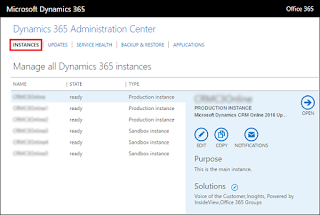 You may think that the Dynamics 365 system administrator would have power to do all the actions needed to manage Dynamics 365, but this is not the case. What's different in Microsoft cloud deployments is that licenses and user accounts are managed in Office 365 by an Office 365 Global Administrator. This role is analogous to a network administrator for an on premises deployment. The Global Administrator is the only role to create new user accounts and assign subscription licenses for Dynamics 365 (and other Office 365 apps such as Skype, Power BI and SharePoint). The Global Administrator can also assign other admin roles, and is automatically a Dynamics 365 system administrator. You can have more than one person assigned as Office 365 Global Administrator. 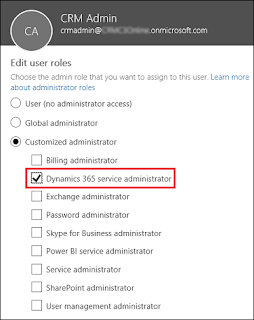 The Dynamics 365 system administrator may assign roles and permissions to the Dynamics 365 user within an instance of Dynamics 365. The Dynamics 365 system administrator also controls all the settings in Dynamics 365. 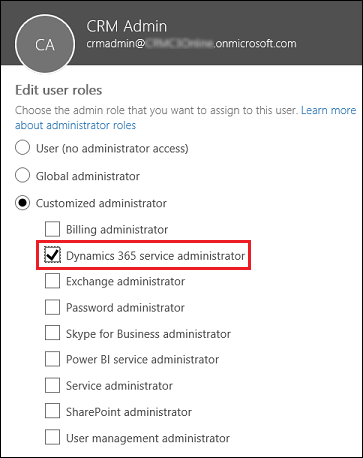 In 2017, Microsoft introduced a new administrator role called Dynamics 365 Service Administrator to Office 365. This is a customized administrator role with fewer permissions than the Global Administrator. It may be configured at the app level. 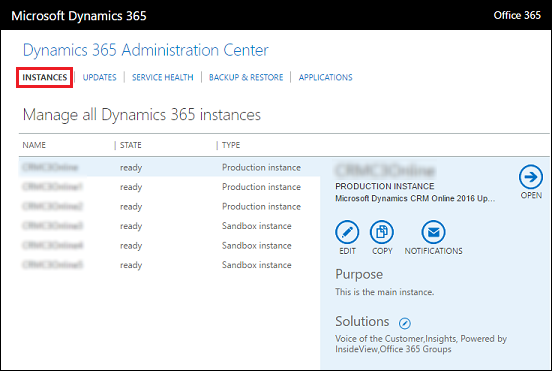 The Dynamics 365 service administrator can manage Dynamics 365 instances, such as performing backup and restore, copy and reset actions. These actions are often used to promote development instances to test or production. The service administrator may open and view support tickets with Microsoft and view the service dashboard and message center. Before you go live with Dynamics 365, be sure that your users, help desk and administrators understand their roles, how they can communicate, and when and how to get help from Microsoft.